Egypt is one of the most admired and most visited places in Africa. Thanks to its rich history this state, lying on river Nile, and partially on the Sahara Desert, is able to attract millions of visitors every year. There are many ways to get to Egypt. We have chosen the way by water. We will leave Jordan and The Arabian Peninsula by ferry we will cross over The Arabian bay to Sinai Peninsula into the town of Nuweiba. Sinai is a small haven for tourists. The big advantage is that there is good transportation here. There are several resorts, one of them is the harbour Nuweiba, the very first place where our vacation in Egyptstart. Besides diving and seeing the beautiful coral reefs there is also a castle to visit. The castle of Zaman is protected by UNESCO. The next beautiful place by the Red Sea is the fishing town ofDahab, also known as a great place for windsurfing. Those who love diving may explore the so called Blue Hole. However the most visited place is the nearbyMonastery of St. Catherine, which,according to the Bible, is the spot at the bottom of Mount Sinai where Moses saw the burning bush. You can go to this monastery for a whole day trip from the resort ofSharm el-Sheikh. Whoever wants to have theirvacation in Egypt full of relaxation must go into this well known resort, which is also another haven for divers. Located there isthe marine national park of Ras Mohamed where divers can observe turtles, barracudas and sharks. To continue our travelling in Egypt we definitely have to say farewell to Asia. We will leave Asia by ferry and over the Suez bay get to the other shore of Egypt, now to Africa to probably best known resort called Hurghada. Hurghada is very busy resort in Egypt. The reason is that summer time is here all year for people living in colder destinations. However we will stay there only for a short time. Once we have seen the city and the local sights we will journey by bus directly to Luxor. In this part of Egypt the transportation should be easier, because the transportation in Egypt is on really good level, not only bus transport but also train transport too. 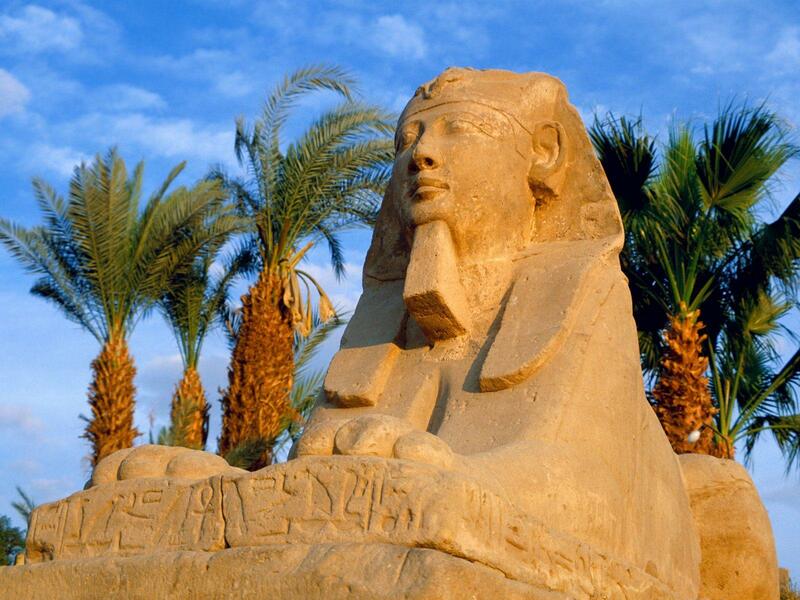 Luxor used to be the capital city of The Egyptian Empire in the remote past and was also called Thebes. It is an ideal place for history fans, as there are two monastery complexes – Karnak and Luxor. Searching for history in Egypt does not finish here as we will visit within our round the world trip the city of Asuán located near Asuándam on Lake Nasser. We will choose travelling by train, but for fans of water transport it is possible to get there from the Nile. From Asuán it is worth taking a one day trip to Abú Simbel. But there are also other famous places. Giza is a city known mostly for its beautiful pyramids located in an inhospitable desert. Pyramid city is located near to the biggest metropolis of Egypt, the capital city of Egypt, Cairo, which is also known as the Big Mango. It is the center of the latest happenings. Old culture meets with the new and modern one. After exploring the city, local historical sites, mosques and markets it is recommended to take several trips to surroundings. A whole day trip to the city ofAlexandria, approximately 2 hours away, will show each visitor Greek, Roman as well as Egyptian history. And the last trip we want to go on will take us to the wonderful city of Saqqara where there are also pyramids, but different to those in Giza. Then we will say goodbye to Egypt and go on to our next destination, which is Kenya.